Kris Boyd admits Kilmarnock have "not been good enough" so far this season and hopes work put in during the international break will pay dividends. 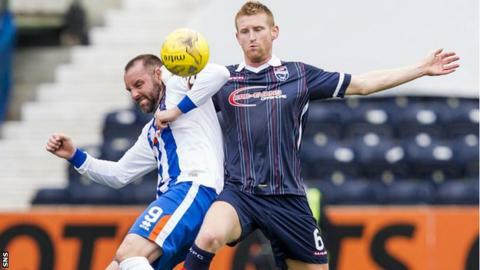 Bottom side Killie have picked up just two points from their opening six Scottish Premiership matches. "We need to get our finger out, everybody accepts that and we have worked really, really hard the last 10 days," striker Boyd told BBC Scotland. "Hopefully, come the game on Saturday against Dundee United, we'll be ready." Boyd, 32, backed his manager Gary Locke's decision not to give the squad time off during the break from domestic football. "The manager's been brilliant, especially the last few weeks," said Boyd, who began a third spell at Rugby Park this summer after leaving Rangers. "A lot of the times with an international break, players are always wanting weeks off but the manager, he stood firm and said, 'no, you are in' and rightly so. "It's up to us as players to rally round and start winning games. "I've been in dressing rooms where managers have been under pressure before and players have totally switched off. That's not been the case. "We've been under a lot of pressure but the players are still responding, the players are still trying to do everything they possibly can." Boyd netted 10 times during his second spell at Ibrox last season but found himself left out of the starting line-up for much of the second half of the campaign as changes took place at managerial and boardroom levels. So far this term at Killie he has been on target twice, once in the league and once in the 4-1 League Cup win over Berwick Rangers. The Ayrshire side lost 1-0 to Motherwell on 29 August and travel to face a United side who are looking to add to their four points so far this season. "After the game against Motherwell, there's a realisation of where we are," said Boyd. "It's massive, not just for us but for Dundee United as well. They're under a lot of pressure as well and [United manager] Jackie [McNamara] is under a bit of pressure. "But, it's one we look forward to, it's one we see we can go and win. We know Dundee United's strengths, we know their weaknesses and hopefully we'll be ready for that come Saturday." "It's between two for me, striker-wise. "Craig Dargo and I liked playing with Michael Gardyne two years ago. I thought we linked up well." "Freddy Dindeleux was somebody who I was actually very, very surprised never really got a move because I thought week in, week out, he was consistently a seven or eight out of 10 every week and very, very rarely let the team down." "It's difficult to judge Ally McCoist on anything that happened at Rangers because there was that much going on behind the scenes. "I think Ally McCoist will be judged on his next job. Knowing Ally the way I do, he'll be sitting hurting, ready to come back in because his pride will have been dented [after leaving Rangers in 2014]." "He's back light training, I don't know how far he is away from participating in a game. "Tope's been out for a good spell then came back for the game and injured himself against Motherwell. "When you look at some of Kilmarnock's performances last year, he was definitely somebody who caught your eye and hopefully the sooner we can get him back the better."